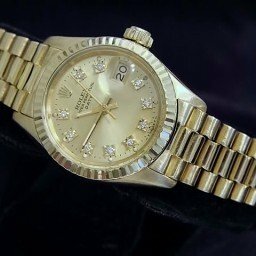 BeckerTime’s selection offers a Rolex Date ladies yellow gold preowned watch sized 26mm. It also has a champagne diamond dial, 18K yellow gold fluted bezel, and solid 18K gold Presidential bracelet. We think you’ll agree, this timepiece will look beautiful on the wrist.  In addition, each purchase comes with a 30-day money-back guarantee and a Lifetime TradeUp Guarantee. This means you can come back to us when you want to upgrade to another model. So, please don’t hesitate to contact us. To learn more, browse our collection of pre owned Rolex watches. 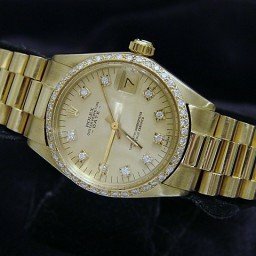 Although not very common, Rolex did previously make a solid yellow gold Ladies’ Date watch. Let’s dive into this ultra luxurious vintage Rolex dress watch for women. Manufactured from the mid-1970s until the mid-1980s, the yellow gold ladies’ Date ref. 6917 is an appealing vintage Rolex that boasts signature design traits from the brand coupled with an awesome retro vibe. First, there’s the 26mm Oyster case that’s both precious thanks to its 18k yellow gold material and water resistant to 100 meters (330 feet) due in part to its screw-down winding crown and fluted case back. Topping the yellow gold case is a fluted yellow gold bezel. The dial of the yellow gold ladies’ Date ref. 6917 includes (naturally) a date window at 3 o’clock, along with the familiar Cyclops magnification lens affixed to the crystal above it. Because of its manufacturing era, the yellow gold ladies’ Date ref. 6917 includes an acrylic lens rather than a sapphire lens. While acrylic is more susceptible to scratching, it is easy to buff out any scratches. Furthermore, it is much cheaper to replace an acrylic crystal than a sapphire crystal. Another element that illustrates the vintage nature of the yellow gold ladies’ Date ref. 6917 is the non-quickset movement driving the watch. This means that the user has to continuously turn the minute and hour hand around the dial to set the correct date in the window. Yet, like most Rolex watches, the caliber at the heart of the yellow gold ladies’ Date is a COSC-certified automatic movement boasting excellent precision, reliability, and durability. Though there are some examples of the vintage yellow gold ladies’ Date watch with the sporty Oyster bracelet, its most ubiquitous bracelet option is the prestigious gold President bracelet. The Rolex President bracelet first made its debut on the men’s Day-Date watch in the 1950s, but it has also found its way on precious metal versions of the ladies’ Datejust and Date watches. Characterized by its semi-circular three-part links construction, the President bracelet wears like a piece of fine jewelry. Supple, lavish, and very comfortable, the design of the President bracelet is highly coveted and pairs perfectly with the yellow gold ladies’ Date ref. 6917 watch. A beautiful version of a ladies’ President watch, the vintage yellow gold ladies’ Date is a great luxury watch to own. Timelessly elegant and instantly recognizable as a Rolex, the Date ref. 6917 would make a great addition to any woman’s wrist.